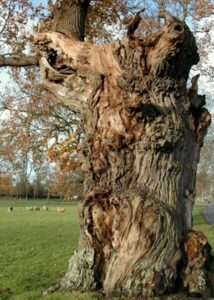 Staff at Blenheim Park have been surveying oak trees for several years, and have recorded 291 living oak trees with a girth of at least 5m. 220 of these veterans stand in High Park, a fragile Site of Special Scientific Interest which is currently closed to the public. 71 can be seen elsewhere in Blenheim Park. This data – collected primarily by Kew’s oak researcher Aljos Farjon – has been compared with other records on the Woodland Trust’s ancient tree inventory. It has revealed that the collection ranks highest across all of Europe.